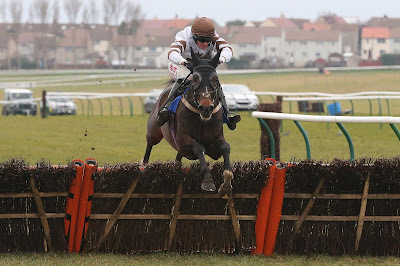 Jim Goldie was the toast of Ayr Racecourse last Saturday when his horse Jonny Delta landed a massive gamble to win the Kilmarnock Standard Handicap Hurdle on Irish Race Day. Available at odds of 5/1 earlier in the day, the Henry Brooke ridden horse was sent off 13/8 favourite and was an easy three length winner over Rhymers Ha’ (7/2). Uplawmoor-based trainer Goldie also had a winner on Friday with A Southside Boy (6/1) (pictured above), also ridden by Henry Brooke landing the Highfield Wines Handicap Hurdle for the James Barclay Trophy. The best riding performance of the two days came in the Ayrshire Post Mares Handicap Hurdle on Saturday when young Irish jockey Eddie O’Connell exuded confidence on 9/4 favourite Twin Plan for trainer James Lambe to lead just before the last and win by five lengths. The Ayrshire Yeomanry were out in force for the Book For the Coral Scottish Grand National Handicap Hurdle, after which Colonel Richard Calendar presented the Yeomanry Cup to Chris Grant, trainer of shock 22/1 winner Rock Relief, another winner for Henry Brooke who also rode Swatow Typhoon (8/11 favourite) to win the opener on the second day. The jockey’s haul was four over the two days including a hat trick on Irish Race Day. Langholm-based trainer James Ewart saddled Wilde Pastures (11/8 favourite) to win the feature race on Saturday - the Fly Ryanair Handicap Chase - while there was a second Irish victory on the day with Ceasar Milan (2/1) winning the Irvine Herald National Hunt Flat Race for trainer Iain Ferguson and jockey William Thompson. There was a really sad aftermath to the Abbott Risk Consulting Hunterston Handicap Chase for the Hugh Barclay Trophy) when the winner Do It For Dalkey (0/30 favourite) collapsed and died on the walk to the Winner’s Enclosure. The horse was owned and bred by former St Johnstone chairman Geoff Brown who was present when the tragedy happened. Trainer Lucinda Russell and jockey Peter Buchanan were both upset at the untimely death of a horse that was being aimed at the Coral Scottish Grand National. Another Friday winner worth mentioning was Flying Squad for trainer Rose Dobbin and jockey Shaun Dobbin in the La Barrique Fine Wines Conditional Jockeys’ Handicap Chase. 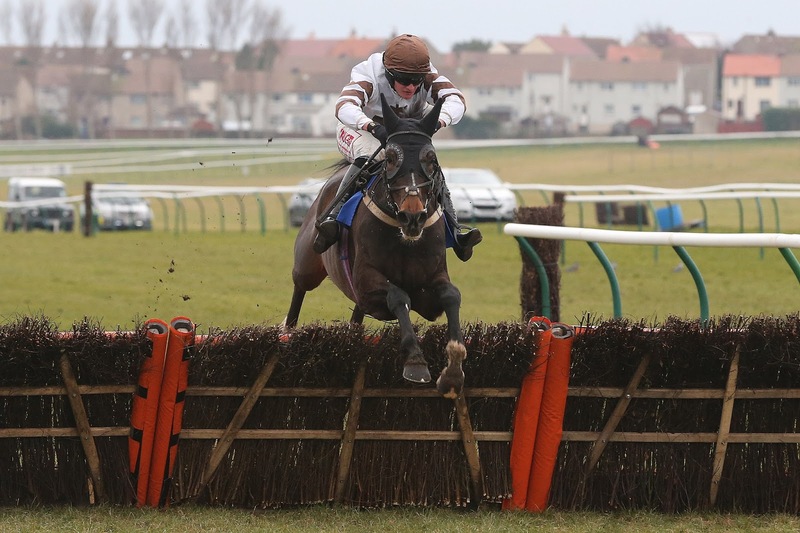 The next meeting at Ayr Racecourse is the highlight of the jumps season at the track - the Coral Scottish Grand National Festival on Friday 19 April and Saturday 20 April.